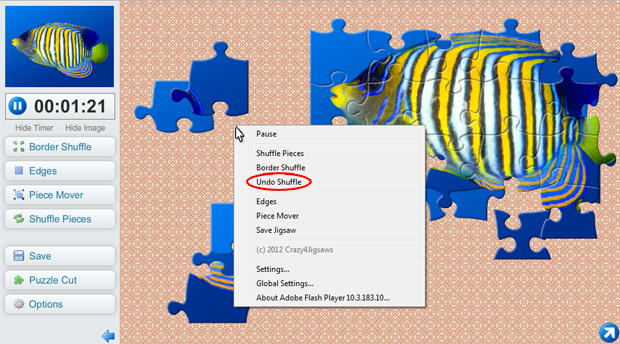 We're pleased to announce our latest Premium feature on Crazy4Jigsaws: the ability to zoom into your jigsaw puzzle! No more tiny puzzle pieces when playing those larger cuts. Check out the video below to learn more about this amazing new feature. Jigsaw puzzle zooming is available exclusively to Premium Members. If you aren't a Premium Member yet, you can click here to join. Happy puzzling! Yesterday we posted about our new bigger jigsaw puzzles. Did you know that Premium Members can actually control how large or small their puzzles appear on their screen? Puzzles can be resized smaller to allow lots of room for solving or enlarged to fill your entire computer screen to easily see smaller pieces and details. 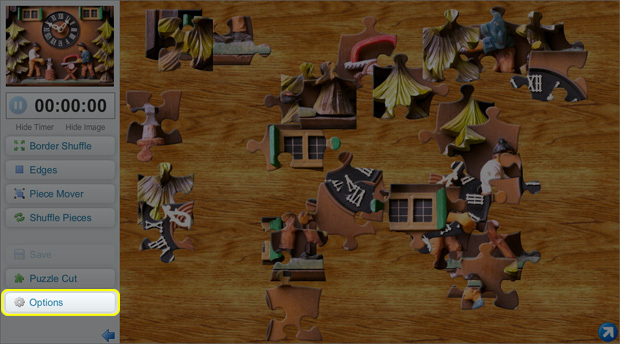 To change your puzzle size, click on the "Options" menu located on the left side of the jigsaw game. Now you can adjust the size using the "Piece Size" slider. 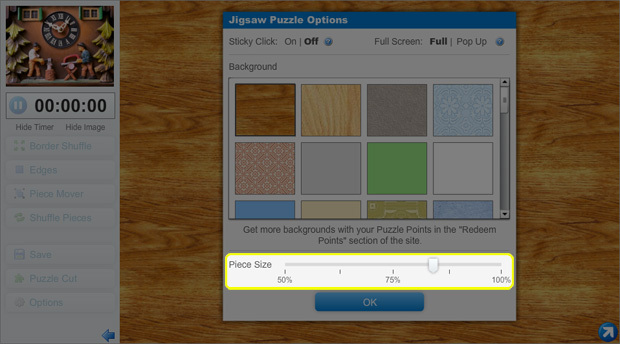 Moving the slider to the left will make the jigsaw puzzle appear smaller on your screen. Moving the slider to the right will make the puzzle larger. A setting of 100% will make the jigsaw puzzle take up your entire computer screen! The "Piece Size" slider will allow you to find the perfect balance between room to spread out your pieces and the ability to see the tiny details on our amazing pictures. Happy puzzling! Here at Crazy4Jigsaws, we're always hard at work making the website more fun. 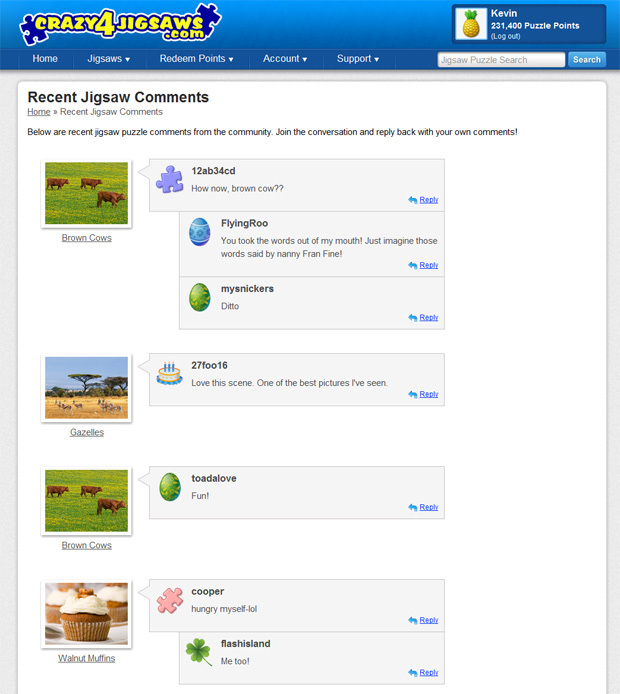 Now you can be even more a part of the community with our latest addition - Recent Jigsaw Comments. You can read through all of the recent jigsaw comments made by our members, and you can even reply back to continue the conversation! 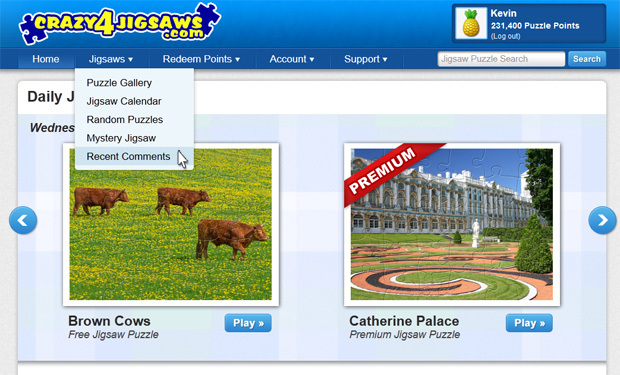 To get there, click on 'Recent Comments' in the 'Jigsaws' dropdown menu at the top of the page. 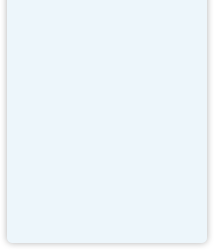 Let us know what you think of this great new feature! Click here to view the recent comments. Happy commenting! Have you ever been in the middle of a puzzle and accidentally shuffled the pieces? Now you can undo the shuffle and border shuffle! Just right-click on the game and click on the "Undo Shuffle" button. This great new feature was requested by members like you. If you have a great idea for the site, please let us know!